This list contains unusual gift box ideas that will help inspire your gift wrapping. Your presents will be as beautiful on the outside as the inside.Your friend will remember the gifts as special and will always look forward to receiving more. This paper mache teapot is an unusually creative gift package for the tea drinkers in your life. It can hold food, tea or smaller sized trinkets. What a memorable way to tell your Mom, sister or friend just how much they mean to you! The paper mache teapot can also be used as cute home decor long after the present inside is gone! Paper pie slice boxes are so adorable! You can use them to hold real slices of cake or as gift packages for something else. Pumpkin pie is a traditional Thanksgiving holiday symbol, but you can change the look of this paper pie craft and decorate it as a slice of paper cake. Place several paper cake slices in a circle, and you have a whole paper cake! What a great idea for a bridal or baby shower. No matter the occasion, this paper favor box will be simply adorable! Make this gift box in the shape of a birthday cake. What a unique and fun way to celebrate someone's special day! The box is so cute that it could almost pass as the present all by itself, but of course, its purpose is to hold the real gift inside. Paper Birthday Cake Box from Oh Happy Day! Children will love these candy filled animal gift boxes. Fiestas y Cumples generously offers these adorable free printables for download. Just print and cut the fox, cat and bunny on computer paper, then wrap the printables around a leftover paper cardboard tube. Press the bottom together to form a box flap, and there you have it! Paper gift boxes that are so charming, and cost practically nothing to make! There may be occasions when you have to give a gift in a pinch and don't have time to run to the store for fancy gift wrapping supplies. Cereal boxes to the rescue! Just cut the cardboard boxes into strips and weave them together to make the cutest paper gift boxes ever! They hold gifts and also work well as thrifty storage containers! Summertime is party time! Why not start the season with a tropical themed social affair? This cute pineapple themed box papercraft would be perfect for the occasion! Fill the pineapple shaped boxes with little candies and give them to your guests as party favors. A paper grass gift box is perfect for an Easter basket, holiday table decoration or spring gift package. Fill the paper "grass" boxes with candy, treats and small trinkets. What an easy and fast spring craft! Kids will love these. 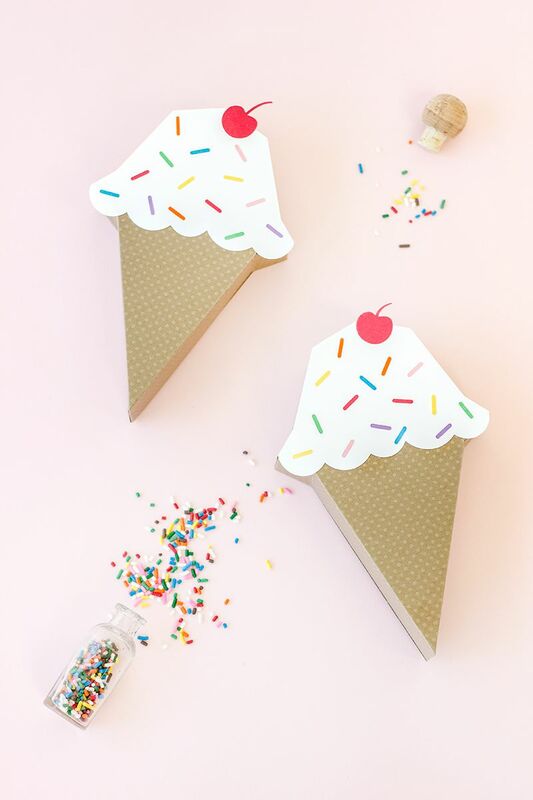 Ice cream cone shaped gift packages are adorable party decorations! Why not make some as party favor containers for your child's next birthday party? This printable treat box is listed as a Valentine's day craft but is perfect for other holidays as well. Print, cut and glue and you will have the cutest packages for your homemade cookies or candy. Delightfully packaged food items are the perfect gift for that person who has everything!